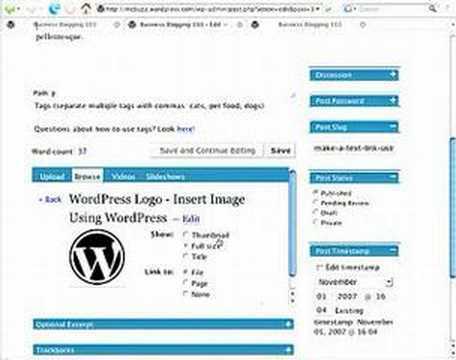 NOTE: This tutorial uses WordPress version 2.3. For the latest tutorials, go to This tutorial shows how to insert an image into a WordPress Post or Page. Once you insert the image, you can make it a clickable link. Steps: Upload the image, give it a Title, insert using the Visual text editing window, select the image and give it a URL using the Insert Link button. – by Mark McLaren of McBuzz Communications.